Our values are simple. Advanced 4 Healthcare Inc. dedicates itself towards providing dignified, responsible and balanced care for individuals to live healthier and happier lives, through constant application of innovative practices based on scientific and compassionate approaches. Our goal is to employ competent, caring, and well-trained individuals who are responsive to the needs of our patients, their families, and the communities we serve. Each staff member will meet the State of Virginia educational and training requirements for the services they provide. We encourage and support continued education of each service provider. 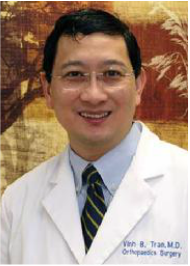 Dr. Tran is a Board Certified Orthopaedic Surgeon by the American Board of Orthopaedic Surgery and the National Board of Medical Examiners. He graduated from Georgetown University School of Medicine in Washington, D.C., where he was awarded the Department of Orthopaedic Surgery Award for outstanding academic performance. He completed his residency in General Surgery and Orthopaedic Surgery at the University of Maryland Medical System and R. Adams Cowley Shock Trauma Center in Baltimore. He then went on to serve as Chief Residency in Orthopaedic Traumatology at Shock Trauma in Baltimore.